UPDATE: Unfortunately, due to circumstances beyond her control, Josie has had to cancel both shows scheduled for tomorrow and Friday. I’ll let you know if new shows are rescheduled in the future. 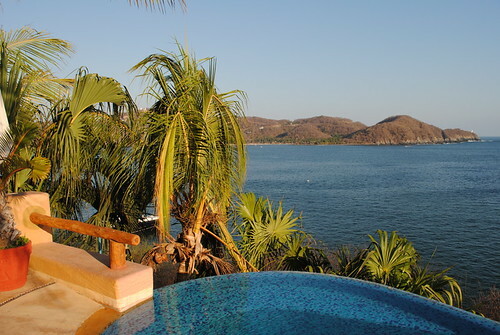 On my trip to Zihuatanejo, Mexico in April, I had the great pleasure of attending a mucho gran fiesta in a breathtaking villa overlooking Zihuatanejo Bay. Along with the ice cold beer, delicious cultural cuisine and smiling local faces was the musical stylings of Josie Kuhn. Having shared the stage with Steve Earle, the Mavericks and Emmylou Harris, Josie’s soulful stylings have earned her an international fanbase. Though she spends most of her days in Zihuatanejo, Josie’s bringing her incredible repertoire of music to Vancouver next week. Often compared to a cross between Patsy Cline and Buffy St. Marie, Josie Kuhn rocks the stage with sultry Mexican-inspired tunes, rocking guitar riffs and seductive vocals. Don’t believe me? Check her out on YouTube. Josie Kuhn will be playing two sets between 8:00 p.m. and midnight at Heritage Grill (447 Columbia St. in New Westminster) [website] on Thursday, July 14th and at 8:00 p.m. at Hop & Vine (1601 Burnswood Drive in Burnaby) [website] on Friday, July 15th. To find out more about Josie Kuhn, visit her official website.